Spring in Ohio...75% rain...seems more like 90%. I have been on my moped as much as possible the last two days. Dawn and I bought her wedding band yesterday at James Free Jewelers...there was a HUGE sale going on. I then had lunch with her and her cousin's...I can't remember what the sandwich was called...pork, ham, melted cheese, mustard, pickles...all made in a panini press...delicious. I then went home and watched the final episode of The Office with Steve Carell, very sad. I then rode my moped to meet the Mayor of Dayton. I did a story with him about how he rides his scooter...and me on my moped. HUGE props to our chief photographer and producer for getting some awesome video of us riding together. Dawn and I went out to dinner last night and came home for a relaxing evening. I woke up early today and changed the brakes on my truck and then mowed the lawn. I took advantage of another beautiful day and rode my moped to work. It has been just such a nice couple of days yesterday and today that it is too hard to pass up. More rain is on the way for Sunday, Monday, and early Tuesday. It looks like most of it will be scattered showers with a few rumbles of thunder. It will be off and on, so not a complete washout. Sunday will be mild with temps in the upper 60's but only the mid 50's for Monday and Tuesday. Sunshine will return for later Tuesday, Wednesday, and Thursday.....before more rain. Hopefully we get to dry out soon...farmers have to be going crazy with the muddy fields. Keep the rain gear handy and have a good one! Well it has been a few days, and again...very busy. I had a kinda short day on Monday, 13 hours Tuesday, and earlier today, Wednesday, 12 hours. I am back in, at 8:30 PM and will be working until at least 9:30 AM tomorrow morning. As you can see the warnings and watches as of 9PM tonight is probably the craziest I have seen in forever. Tornado Watches (yellow) from Indiana and Ohio down to the Gulf of Mexico and east to Maryland and New York. That is insane how large of an area that is under a Tornado Watch. 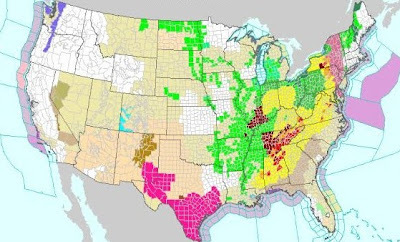 There are also over a handful of Tornado Warnings through the Deep South as well as Flash Flood Warnings. Here in the Miami Valley we have a line of storms in Illinois and Indiana that will be rolling through late this evening and into the early overnight hours. With us under a Tornado Watch until 3AM, I will be here working until my reporting shift will start... we will see how that two hour nap will do for me. Jeff and I will be keeping an eye on things through the next few hours so rest easy, but stay alert. Buckeye has to be the best dog in the world...seriously. When Dawn moved in with me about to two and a half years ago there was one stipulation...Buckeye was coming. She was living with her parents and working in Cleveland and she moved in with me to better our relationship and I love her the world over for doing that. Her parents worked and her brother was at college so no one could check in on him through the day...so he had to come. However, I was not really a dog person. I remember seeing the back of our family's dog's throat once after pestering it a little. (I know my fault.) I could stand dogs, but really had no desire to live with a dog inside the house. Too bad, he was coming. I completely regret having any reservations about the pup since. Buckeye is currently 9, I think...maybe 8, but his birthday is this August. He has had cataracts since birth. He was taken to the vet shortly after the family got him wondering why he couldn't see very well and he has basically been nearly blind since birth. He can see things out of the far corner of his eye occasionally and when a bright object catches him off guard he will jump back. For the most part he remembers where everything is inside the house, and unless I get him hyper he never bumps into anything. He also has a tumor on his back near his tail. It is a bulge a little larger than a golf ball, but it is non-cancerous. His real name is Buckeye Butler, but sometimes we like to call him Flawless. Buckeye loves to sleep. He loves to feel the warmth of someone who has just left the bed. Sometimes he will know you got up, and when you come back he will be sleeping on your pillow just to soak in as much warmth as possible. When he gets super comfortable he will sometimes roll onto his back during a deep dream and occasionally paw at the open air. Something that only happens on occasion is Buckeye howling along with a fire truck. He will only do it to the long high pitch that slowly drops over a 20-30 second period. At first it would normally only be in the spring or fall when the windows were open and he could howl along and try to mimic the sound of the siren. Dawn and I have tried making the sound ourselves and have gotten him to start howling along. Afterward, we always tell him how good of a dog he is...if the house ever catches fire and we are sleeping, at least he will howl as the firetruck is rolling up the street. Another thing that Buckeye loves more than his dog treats is being outside or in the car. He loves sitting in the car and I often wonder if he wonders where the next trip will take him. I probably take him in my truck too often, but I know he likes taking trips to run errands. He loves putting his head out the window and often the cut-off is about 40 miles per hour. I will say that one of my favorite pictures of him was when I lived in Lima. After my last TV station was bought out, I had a month of so of waiting until my next job. I was particularly depressed during this time and often found myself wanting to be outside in the sunshine. Of course Buckeye would want to be out there all day as well. I remember sitting on the front steps of the apartment in the warm sun with a million questions flying through my head...but Buckeye... not a care in the world. He put his front two legs on the next step down, sat on his back legs and would turn his head as each car passed the steps...soaking in the sunshine. He could occasionally bark if a diesel truck passed or a bicycle rolled by and the pedals were going reverse so you get the ching-ching of the freewheel... he hates those sounds. He sat there loving every second being outside and just lived in the moment. It made me appreciate the small things in life and to be thankful for what I had at that very minute. I think he is the best dog in the world and I am thankful that my fiance decided to move in with me, and bring him along. More rain for Monday, Tuesday, and Wednesday. Wednesday looks to be the heaviest of the rain and there is a slight chance every day for severe weather. Although it is a slim chance, make sure to be prepared. Maybe a few showers early Thursday with cooler temps in the 50's, but at least clearing skies will finally try pushing into the area for the end of the week. Continue staying dry and have a good one! Yesterday we officially got the Dayton Area Mopeders together at my place for dinner and a ride. It rained most of the afternoon and I was getting heckled for arranging this on a rainy day... but I was planning this about three weeks out, so forecasting a chance for rain would be a crap shoot. I did take a look at the radar after dinner and we had a dry slot moving into the area and we were able to go for a 13 mile ride. No one broke down and we even had a chase vehicle. We stopped before returning back to my place for a group picture as well. It was a great time meeting everyone and I look forward to getting together again, soon. On to the weather... More rain for Sunday, Monday, Tuesday, Wednesday and Thursday. We can expect to see a LOT of heavy rain. Some locations may see half a foot or more of rain. Flooding will be a huge concern. If you live in a flood prone area, make sure to prepare. Temps should get into the 70's for Monday and Tuesday, but much cooler for the end of the week, but at least sunshine will return to the area. Stay dry and have a good one! Thursday was such a beautiful day it was hard for me to stay inside. Instead I was outside as much as possible, despite feeling horribly sick...but I was sick for a good reason. In my last entry on Tuesday I mentioned how dangerous the weather was likely to be Tuesday night. Well sure enough we had two tornadoes. The storms were not expected until after midnight and I was able to go to the Reds game, thanks for the tickets sis. It is always fun going to watch the Reds, even if they do lose. Well after the game Dawn and I hurried home, I geared up into the station vehicle, and hit the road. I started north when a tornado warning was issued for Mercer and Auglaize Counties. I arrive into Celina shortly after the storm came through and before some of the local city workers arrive to stop traffic. There was damage like I have never seen in the Miami Valley for several years. Cars were tossed like toys, advertisement signs leveled as if a giant stepped on them, and sides of buildings torn apart to mimic a bomb going off next to it. Just as I was leaving they had started turning on the lights at the Walmart and other local fire departments were showing up with generator lights to light up intersections and such. The more lights that were turned on, the more devastating images started popping up. I also stopped by a country road that was upstream of the damage and found a few houses torn apart and talked with a few of the people... everyone was devastated, but at least there were no injuries. This is why a weather radio is so important... you can set the alarm to go off when storms like this roll in, and you will be able to get to cover. I pray that everyone will recover from the tornadoes and realize how lucky they are to have no injuries. After getting video for that, I booked it back to the station and reported for the morning shows and then came home and went to bed after being up for about 32 hours. I slept most of the day on Wednesday until Dawn came home and woke me up. Yesterday was nice and sunny meaning two things.... mow and not sit inside. I felt pretty sick, I am sure from walking around soaked in the rain in Mercer County with the tornadoes. I did finish working on my moped last night. 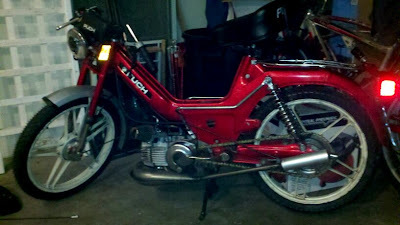 I changed the wheels and handlebars while putting on a new magnum dashboard with ignition switch. Anyway on to the forecast: Lots of rain is headed to the area. We are already very saturated from Tuesday/Wednesdays storms. We could easily see 2"-3" of rain over the weekend and some places could see up to 5" if they are where the rain keeps training, back-building. We have a slight chance for severe weather, so stay on your toes. We have the chance to see rain almost every day through the middle of next week. Temps will be in the 60's for highs, so at least it will be mild. Watch out for flooding and have a good one! I really should be in bed. I had 50 minutes of sleep two nights ago and only 3 hours last night.... And however long I get to sleep before 4PM today (Max 2.5 hours) is all I am going to get tonight. However, it would be a huge disservice by not writing a quick entry. Tonight we have a very good set up for severe weather. This does include the chance for isolated tornadoes. Right now the Severe Prediction Center of the National Weather Service has most of the Miami Valley in a Moderate Chance for severe weather. The worst part of this will be the timing. These storms will likely arrive to Ohio around or shortly after midnight, while everyone is asleep. They will plow eastward and be out of near by sunrise tomorrow. The main threat looks to be straight line winds and large hail, however as I mentioned before, there will be the chance for tornadic cells as well. The low pressure looks to track just to the north which will allow directional wind shear.... varying directions of the wind throughout a column in the atmosphere. This is a very important for ingredient for the formation of tornadic supercells. Like I said, I will be up chasing these storms getting video of them and then reporting in the morning on the morning show. I need to head to bed now because my 13 year old sister gave me Reds tickets, and I will be darned if I can't use them. So time for bed, Reds game, storm chasing, then reporting... then back to bed again. Feel free to follow me on Facebook and Twitter as I will be updating throughout the overnight. I also HIGHLY recommend getting a NOAA weather radio and using it tonight. Night time storms are much more deadly because people do not seek shelter like they should. Be safe and have a good one! Today was absolute bliss. We broke the record high temp in Dayton by two degrees. The previous record of 82 was set in 1905, and we broke it by 3PM. I sure hope everyone took advantage of the beautiful weather because tomorrow is going to be rainy with a few thunderstorms and no temperatures in the 80's on the 7-day... as a matter of fact, no temperatures in the 70's. I rode my moped into work today and it may take me about 3 minutes longer to get to work...but totally worth it. Dawn and I also went wedding band shopping today. We are still in the research stage and did not jump on anything while we were at the stores. Her ring is very hard to try and find a complimenting wedding band. Our search will continue as we add check marks to the to-do list. OHHH! We had a low key evening last night and stayed at home and watched "Worst Week." I don't know if any of you have seen that television series, but we both find it hilarious. It only lasted one season before being cut, but we have no idea why. You should try to check it out. The DVD can be found almost anywhere, we found ours at Big Lots for only a couple bucks....score! Like I mentioned, showers and storms for Monday and a few showers possible early Tuesday. Then we dry out for the middle of the week with more rain on the way for Friday, Saturday, and unfortunately also Sunday. Temperatures will be seasonable all week with highs in the 50's and 60's. Have a good one! Well we had a few showers and rumbles of thunder for much of the early afternoon. The rain shield held farther north than expected. At least temperatures were in the 50's and 60's for most of the day. Tomorrow will be much warmer. Since we did not get into the 70's today, it may be hard for us to make the jump all the way up to 80, but I have hope. I have spent the last few days working for Jeff Booth and in the mornings I have been slowly cleaning the garage. The tool bench and the rest of the garage was slowly getting a little unorganized so it is nice to finally walk in there and see things organized again. I still have held off mowing the grass. Many of my neighbors have started, but I have always noticed that if you cut the grass before it really starts growing in the spring it shocks it a little....so I am giving it a fighting chance, at least for another day or two. It is hard to believe that our wedding is only 16 weeks away. We have almost everything nailed down and planned, but there are small things that we still need to nail down. I think one of the biggest things that we still need to do is get our wedding bands. I know what I am getting, but Dawn is still up in the air. We put together the archway for the wedding and are still on the prowl for a great deal for one of the pop-up canopy tents so the musicians can sit under... they can't have their instruments in direct sunlight. Anyway, we have PLENTY of time right? 16 weeks!?!?! Tomorrow it looks like we may break the 80 mark for the first time this year...the more sunshine the better, but we will have partly cloudy skies with more clouds later. Showers and storms will roll into the area very early Monday morning and will drop our temperature back down to seasonal temps..upper 50's and low 60's for much of next week. Enjoy the great weather tomorrow! Nice afternoon with plenty of sunshine, but the clouds rolled in pretty quickly. I got the new moped running and it inspired me to ride my Sebring into work this afternoon. It rode awesome until I got about a mile from home during my dinner break. I think there is something clogging the fuel line that is very, very old. It had bright spark, compression, but not a lot of fuel. Dawn made dinner and it was already ready so I called her to come pick me and the bike up. I could have tried pedaling or walking the bike home, but I knew she was hungry and that would only delay dinner longer. I will have to take a look at it in the coming days....good thing I have others. Showers are already rolling into the area and they will continue on and off overnight with a few rumbles of thunder possible towards daybreak. The showers and storms will become more scattered as the day progresses and we could even see a few scattered showers and storm Saturday, but less likely. We will get into the mid 70's for Saturday and possibly into the low 80's for Sunday if we see enough sunshine. More storms will roll into the area late Sunday night and through the day on Monday with highs back in the mid 60's for the middle of next week. Enjoy the warm temps and have a good one! There was just enough sunshine to pop up a few showers this afternoon with a little instability left from yesterday's storms. Well despite the temperature 46 at the house, it fell as SNOW! The freezing level is so low in the atmosphere that there was not enough time for it to melt before reaching the surface. It was only flurries where I lived, and by the time I could find a flake land and try to snap a picture, it had already melted. The radar did show a few very light cells across the area and I even got a few Facebook comments about others seeing the snow as well. Temperatures will be chilly again tonight, but much warmer are will arrive later tomorrow. We will be into the 70's for the weekend, maybe trying to give 80 a run for its money. We will also see scattered showers and storms Friday through Monday, but hey, it's going to be warm! Time to make dinner...have a good one! Today turned out BEAUTIFUL. We had the clouds move out mid morning and only the Northern part of the Miami Valley saw light sprinkles. With all the sunshine, we were able to climb up to a high of 73 for the day...not to shabby. The air is still very dry, which may affect tomorrow. Severe storms are still expected for tomorrow, but I do not anticipate them quite as severe here in Ohio as compared to the Tennessee and Mississippi Valley areas. They will have much more moisture and fuel for the storms. St. Louis actually reached 90 degrees today. The upper level trough and jet max will be just behind the front. If it rolled through together then it would be much worse as well. With all of this said, we still have a lot of key ingredients for the weather to turn very nasty. With the surface winds as strong as they are, they will fuel the storms as much as possible. They will roll through in the late morning and afternoon so make sure to stay alert. I highly recommend a NOAA weather radio. The one that I own only costs $30. Some people think that that is a lot, but how much is a tank of gas? How much is your life worth? Exactly. Buy a NOAA weather radio, program it to your county, and be prepared when severe weather hits. It will sound an alarm to let you know if severe weather is rolling into your county. Since the National Weather Service is the one that issues the warnings, you will get the warnings straight from them as soon as they are issued... no middle man to relay the information. When there is a Tornado Warning in the middle of the night, the alarm would sound and you would be able to seek shelter immediately. Wrapping things up... cooler weather will dive in for Tuesday, but should be warm and dry for the rest of the week until Friday, and scattered showers will stick around until the weekend. Stay alert and have a good one! I never seem to get time to sit down for long. Yesterday I met up with a few friends at Bill's Donuts in Centerville. They stopped on their way to the moped rally in Nashville this weekend, so I figured the least I could do was ride over and grab a donut with them. After that I stopped by Dawn's work for a few minutes and then off to Greenville to move a piano my mother got for my sister. It was quite heavy, but with four guys we managed to get it into the basement, thank goodness we have a walkout. I then came home, watched a movie with Dawn and we went out for a little while last night. This morning I was a "celebrity" judge for the Submarine House's Super Duper Cheese Steak eating contest. 16 inches of food, weighing in at over 40 oz. (2.5 pounds).... and the winner downed it in 2:19 minutes. That's right. It was quite entertaining, but just watching it made me not hungry for a cheese steak, for a few minutes. As far as the weather is concerned... the cold temperatures may be over for a while. We warmed up to 51 for the high today and that was enough to trip off a few isolated showers and sprinkles. You could see the clouds bubbling up through the afternoon thanks to the "warm" temperatures. The air was so dry that much of it did not reach the ground, which is called virga. You can see the precipitation falling from the sky, but it thins out and evaporates before it reaches the ground. Once the sun set and the temperatures started to drop, the showers and clouds quickly disappeared into thin air. Tomorrow we could once again see the pop-up showers. Temperature will be about ten degrees warmer and winds will be about 15-25 mph through the day. These winds will continue pumping in warm air into Monday. The mix of the warm temperatures, added moisture and a few other upper atmospheric conditions will all add up to a chance for severe weather on Monday. While the Miami Valley may see a few strong to severe storms on Monday, the real punch of dangerous weather looks to be in the Tennessee Valley. Strong winds, large hail, and even a few tornadoes are likely with the set-up on Monday between the Ohio Valley, Tennessee Valley, and Mississippi Valley. This is all in front of a cold punch of air that will leave us in the mid 40's for Tuesday, but we will rebound quickly into the 50's and 60's for the end of the week. I will update you again soon...have a good one!